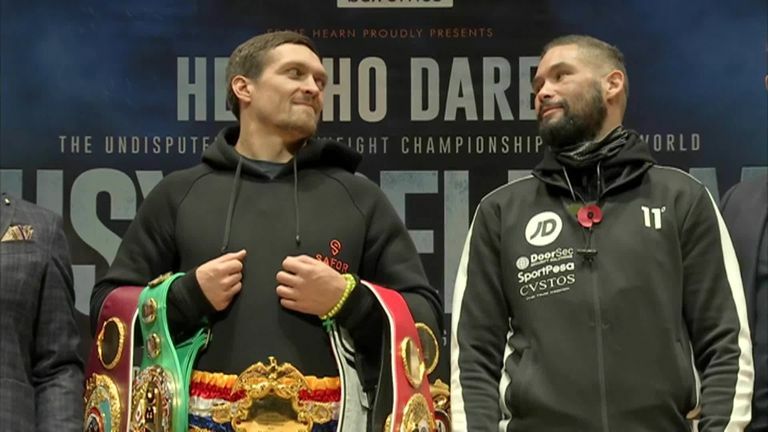 There is fire in the eyes of Tony Bellew, writes James Dielhenn, and it caught the attention of Oleksandr Usyk. But will it burn him? An aggressive Bellew re-emerged on Thursday. With just over 48 hours until the first punch is thrown, his demeanour has changed. Tracksuit on, bandana concealing his snarl, Bellew was a throwback to the underdog that bit the heels of David Haye before their first, bad-tempered fight. He spoke of money and legacy but cut the figure of a kid from the streets who doesn't accept a bigger boy in his classroom. When promoter Eddie Hearn joked about peace and respect throughout the build-up, Bellew interrupted: "There's still time." Usyk doesn't speak English but he understood. It was in Bellew's eyes. "Look at his eyes - they are angry", the undisputed world cruiserweight champion said through his translator. Bellew, sat just one seat apart from his rival, was leaning forwards and staring at him ferociously. Usyk found the intensity of the afternoon quite comical. He couldn't prevent out-and-out laughter when Bellew's trainer, Dave Coldwell, explained their confidence in a knockout victory. That was the moment when Usyk and Bellew's mindsets were at their most exposed as they head into their fight for IBF, WBA, WBC and WBO gold. Usyk, a special talent and a fascinating personality who shares a birthday with Muhammad Ali, was mischievous and jovial. He wore a hood during the face-off just to mock Bellew's masked face. Bellew's threatening attire was not intended to be amusing. He was the bully at the press conference and must be the bully in the ring on Saturday. The prevailing theory is that a Bellew upset win requires a knockout; that he cannot and will not out-point the masterful Usyk over 36 minutes. But a raise of Bellew's eyebrow when making the over-the-top admission that he only has a "puncher's chance" suggested that he is scheming. The Liverpool fighter will not be relying on a Hail Mary swing, any more than he was reliant on running away from Haye's powerful punches when they first met. He is opposing a man that Anthony Joshua described as "perfect" but Bellew believes he can rough Usyk up, show him depths to professional boxing that he has never previously seen, and effectively beat the will out of him. "I cannot outbox this man," Bellew said, but he believes in his greater ability to persevere through pain and fatigue. 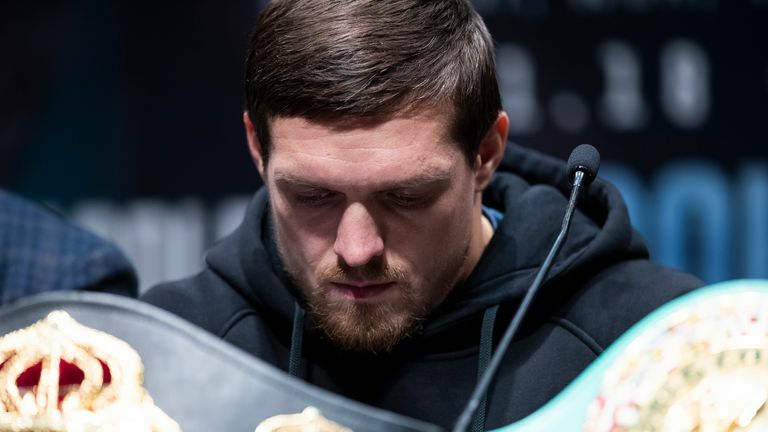 If Usyk's laughter on Thursday was due to an expectation that Bellew will chase him desperately and hungrily from the first bell, he may be mistaken. 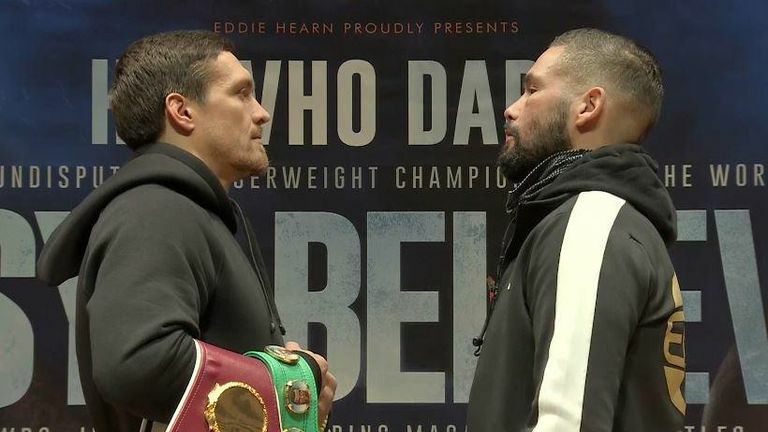 Equally, Bellew will be aware that Usyk survived being clocked very hard by Murat Gassiev, a renowned puncher, in the World Boxing Super Series final. Usyk overcame that but the sight of his jab, on that occasion, being too predictable will add to Bellew's belief. Bellew has lost to a southpaw in a world title fight, and beaten a southpaw in a world title fight. He has never, by his own admission, faced a southpaw with the skills that Usyk brings. There is a strong argument that Usyk has never been whacked as hard as Bellew can whip his left hook. This is some farewell for Bellew, welcoming one of the three best fighters in the world for the last fight of a career which has already proved its point. But thoughtfulness must wait until Sunday morning, judging by Bellew's belligerence from beneath the bandana. It was in his eyes.